A piece of work by the IBeA research group in the UPV/EHU’s Department of Analytical Chemistry confirms that ceramic vessels found on a site in Lekeitio were in fact used to store whale oil, which could have come from whales belonging to the Balaenoptera genus, among others. The research focussing on the analysis of organic residues preserved in archaeological samples has opened the doors to knowledge about past customs and traditions relating to trade, food and even rituals of a cultural nature. In this respect, among the most common materials found on archaeological sites and excavations are ceramic vessels. The porous matrix of the ceramics means that they are ideal materials for preserving specific compounds (known as biomarkers) of certain foods and materials, such as animal or vegetable fats for hundreds or even thousands of years. So “the analysis of fragments of vessels reveals what these materials were used for in the past, enabling important information to be discovered about ancient traditions,” explained Laura Blanco-Zubiaguirre, the author of the study. Whale hunting was undoubtedly one of the most productive activities off the Biscay coast during the 16thto 18th centuries. Basque fishermen used to sail across the Atlantic ocean to Newfoundland and Labrador (Canada) and once the whale had been caught, its valuable oil was extracted. This was put into wooden barrels and transported back to the Basque Country where it was sold in Spain and other locations in Europe. Before it was traded, the fat used to be stored in large earthenware vats on the docks of the Basque ports so that they were ready to be distributed. Excavations carried out recently at a site in Lekeitio have uncovered a storeroom dating back to the 16th-17th century relating to the trading and storage of whale oil. 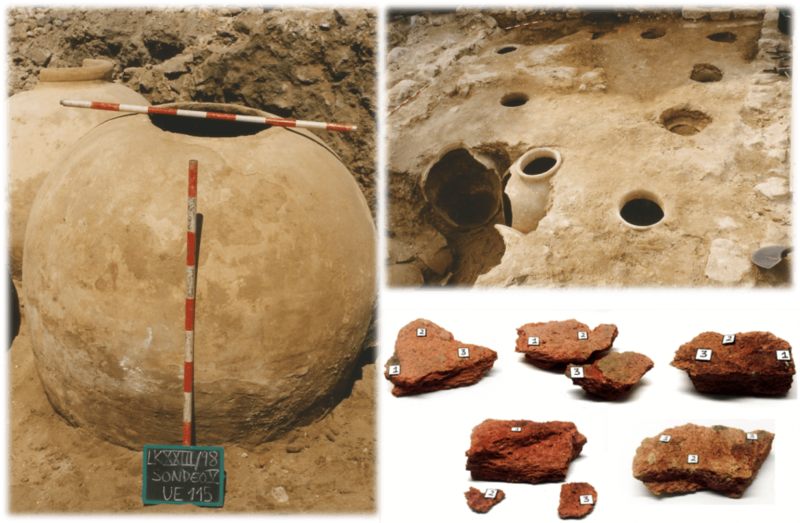 This research by the UPV/EHU’s Faculty of Science and Technology analysed five ceramic fragments belonging to five different vats recovered from the Lekeitio site. To do this, 1 g of lipid content was extracted from the fragments in each ceramic sample and the extracts were analysed using chromatographic techniques, such as gas chromatography coupled with mass spectrometry (GC-MS), and high resolution liquid chromatography using high-performance liquid chromatography coupled to electrospray ionisation and quadrupole time-of-flight mass spectrometry (HPLC-ESI-QToF). “The purpose of this equipment is to chromatographically separate the different organic lipid compounds present in the ceramics and to break up and identify these fragments using mass spectrometry,” pointed out the UPV/EHU researcher. To be able to properly identify and confirm the presence of whale oil, 4 fresh samples of blubber from various whale species were analysed. “These samples,” said Blanco, “were subjected to the same analytical procedure as the archaeological samples in order to establish a characteristic lipid profile of each species and be able to eventually compare it with the results obtained from the archaeological ceramics”. In accordance with the results of the fresh samples used as reference materials, the lipid content may be classified according to whale genus. In other words, the species in the Balaenoptera genus have a similar profile of triglycerides and fatty acids, whereas the profiles of the species of the Megaptera and Phocoenagenera are totally different. So “it is possible to find out the genus of the whales whose blubber and oil were extracted and stored in the vats in Lekeitio by analysing the ceramic fragments using GC-MS and HPLC-ESI-QToF and comparing the results with those of the reference profiles,” said Laura Blanco. “Once we had analysed the archaeological samples, we saw that their lipid profile matched that of the species belonging to the Balaenoptera genus perfectly,” she pointed out. Yet the historical records point to the hunting of the sei whale and the right whale, belonging to the Balaena and Eubalaena genera, respectively, as the most common ones around Canada. So “the analysis of fresh whale blubber from these genera needs to be carried out to compare their lipid profile with that of the species analysed in this work, and their differences and similarities studied,” said Blanco. “The data obtained in this work have made it possible to confirm that the ceramic vats found on the Lekeitio site were in fact used to store whale oil and, what is more, this oil may have belonged to whales in the Balaenoptera genus, among others.” So “applying a range of analytical techniques is hugely important to obtain as much information as possible about the archaeological samples,” stressed Laura Blanco.